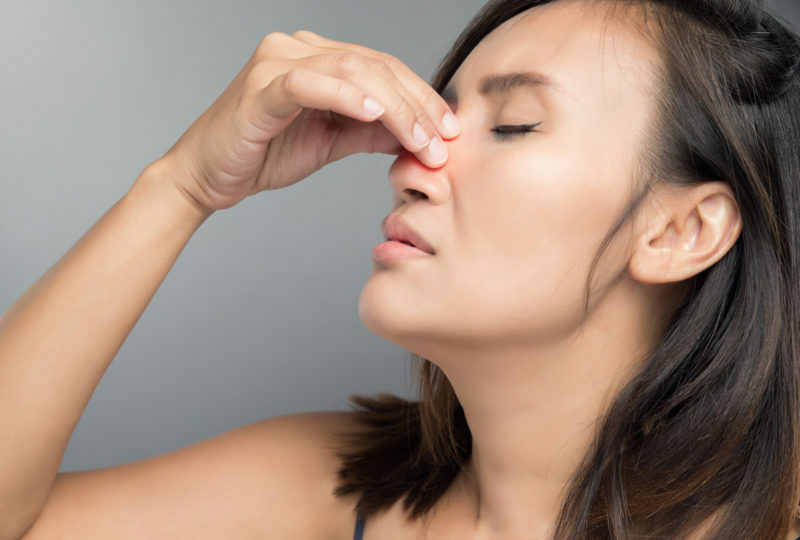 When you have a medical condition or obstruction that affects your nasal passageways or sinuses, you may be in constant discomfort or experience difficulty breathing. If you are looking for relief, you should seek treatment at our otolaryngology practice. Our expert ear, nose, and throat (ENT) physician, Dr. Michael Yerukhim, offers a wide range of nasal health treatments for patients in the Cleveland area. Let our board-certified Otolaryngologist provide you with the top-quality care you deserve! Deviated Nasal Septum: A person has a deviated septum when the middle walls separating the nostrils is displaced or crooked. Significant deviations can result in breathing problems, pain, pressure and sometimes headaches as well as lead to external deformities. In the hands of our expert nasal surgeon, the solution is usually a 45 minute outpatient procedure, with drastic improvement in symptoms. Chronic Sinusitis: Chronic sinusitis encompasses an wide range of symptoms. Common symptoms include nasal congestion (which can make breathing difficult), swelling and pain in the forehead or face, drainage of mucus from the nose or into the throat, recurrent or persistent sinus infection, headaches, fatigue, etc. During your personalized evaluation, our sinonasal health expert physician will ensure that all treatment options have been exhausted for you prior to even considering surgery. Conditions Requiring Sinus Surgery: This is indicated when all medical therapies have failed. The purpose of sinus surgery is usually to remove blockages (such as polyps), resolve chronic infections, improve drainage of mucus, and allow better delivery of medication. This type of surgery may involve the removal of bone, internal growths, or damaged / infected tissue. During your personalized evaluation, Dr. Yerukhim, an expert sinus surgeon, will review with you and imaging that you may have, as well as options and indications for sinus surgery. Balloon Sinuplasty: This is a newer, minimally invasive procedure for treatment of sinus disease and headaches. It often can be performed in the office, with local anesthesia. The procedure has minimal down-time and fewer risks of complications. Our sino-nasal surgery expert - Dr. Yerukhim - will review your candidacy for this procedure during your personalized evaluation. Allergy Therapy: If you are concerned that you might have allergies, we can provide you with both testing and treatment, including allergen immunotherapy (allergy shots) to provide you with the relief you need. This therapy will help your body change how it responds to the problem allergens, so you finally find relief. Sleep Apnea: Sleep apnea is a serious disorder that results in ongoing interruptions to a person’s breathing while he or she sleeps. These lapses in breathing can often occur more than 50 times within the span of an hour. The person does not wake completely, but the quality of sleep is drastically reduced. This further puts additional strain on the heart, lungs and kidneys. Patients often feel tired and have trouble staying awake and concentrating during the day. Sleep studies are used to diagnose and evaluate the severity of sleep apnea. In children, tonsillectomy is the recommended first line treatment. In adults, CPAP machines are the first line therapy. When CPAP fails, a number of surgical options may be available, with optimal nasal airway playing a key role. These will be discussed at your comprehensive customized evaluation by our expert surgeon.